One of my favorite Indian dishes is daal. There are so many variants of daal that this “dish” could fill a cookbook. I made this version after picking up a jar of tamarind paste and daydreaming about what to do with it. The tartness of the tamarind is a wonderful surprise that is mellowed and smoothed by the canela. 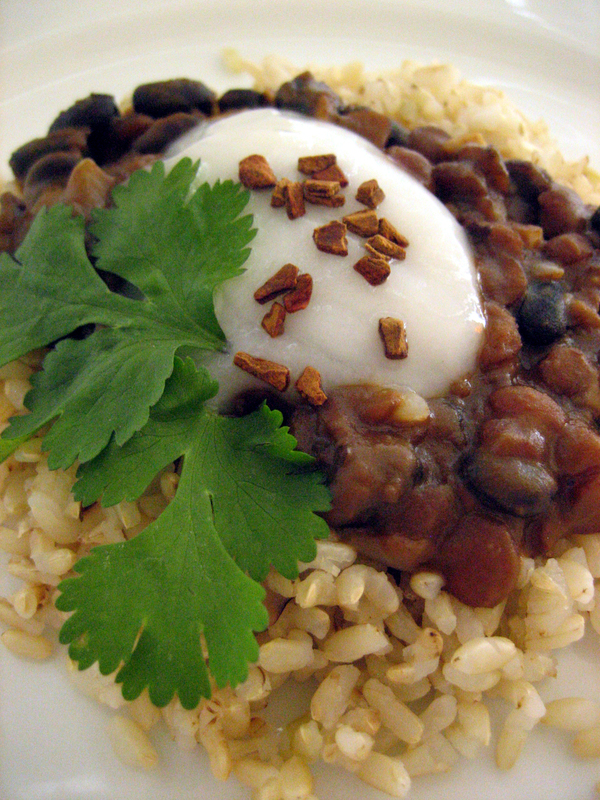 Though black beans are traditionally used in latin dishes, they worked really well with these Asian flavors. Optional garnishes: fresh cilantro, non-dairy yogurt [So Delicious plain yogurt is our choice], cinnamon nibs, shredded coconut. Soak beans overnight. Drain and rinse. Place in a large pot and cover with vegetable stock by a couple inches. Add the star anise and cinnamon stick. Bring to a simmer and cook for 30 minutes. Add the split peas and continue cooking until the beans and peas are tender. Once tender, drain the beans and remove the star anise and cinnamon. Bake at 350°F until bubbly. I love the idea of sweet potato puree and coconut milk in here too. I have yet to find tamarind in the store but it seems like it adds a lot to a dish! It adds an incredible flavor that makes ferreting out a jar well worth your time! I love Indian cuisine (tamarind, in particular), and this sounds incredibly delicious! I cannot wait to try it! Thanks so much for sharing the recipe with our fans on our Facebook page, too. You’re most welcome. Your yogurt really compliments the flavors.